Last minute bookings are no problem since everything is emailed to you! Romar Place 404 is as close as you can get to the Gulf without actually being in it. Ocean front balcony and master suite. Mere steps to the beach! Feel as if you've stepped into an island paradise when vacationing in Romar Place 404. Jungle prints, tile floors, and fabulous furnishings make this fourth floor unit unlike no other. Enjoy our fabulous glass roofed heated indoor pool and separate jacuzzi as well as the outdoor pool. WE'RE DIRECT BEACHFRONT ON THE FOUTH FLOOR OF ROMAR PLACE - ONE OF THE BEST BUILDINGS IN ORANGE BEACH. If you are looking for two units side by side, check out VRBO #418971. This is unit #403. We're friends who coordinate so families can be together. Be sure to check calendars for availability. Four cable TVs. DVD players. Over 140 DVDs provide entertainment for everyone. Washer and dryer in laundry room get you quickly back to the beach in dry suits. Dine or lounge on the balcony while admiring the beach view and fabulous sunsets. Our family loves going to the beach and would be delighted to share our little piece of paradise with YOU! Login info and password will be emailed along with entry information. Two elevators and an open stairway mean there's never a wait. Coffee filters, salt and pepper and assorted spices are in the upper cabinet to the left of the stove. Rectangular beachfront table offers Gulf views while dining. Additional seating for 3 at the kitchen bar. (4) A TV in every bedroom as well as one in the living room. 250+ DVDs for both adults and children are waiting for you next to the main TV. 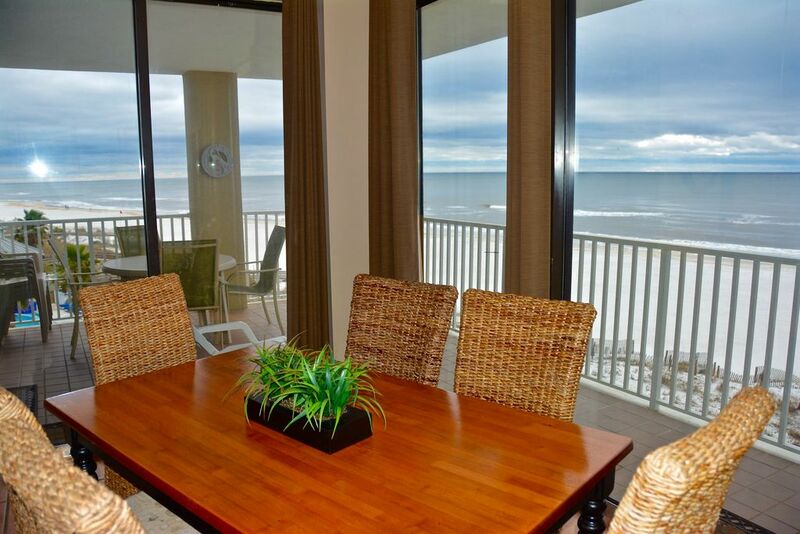 Unobstructed spectacular views of the beach, sunrises and sunsets! (2) Indoor pool (heated in winter) and beautiful beachside outdoor pool.